Despite their important implications for interpersonal behaviors and relations, cognitive abilities have been largely ignored as explanations of prejudice. We proposed and tested mediation models in which lower cognitive ability predicts greater prejudice, an effect mediated through the endorsement of right-wing ideologies (social conservatism, right-wing authoritarianism) and low levels of contact with out-groups. In an analysis of two large-scale, nationally representative United Kingdom data sets (N = 15,874), we found that lower general intelligence (g) in childhood predicts greater racism in adulthood, and this effect was largely mediated via conservative ideology. A secondary analysis of a U.S. data set confirmed a predictive effect of poor abstract-reasoning skills on antihomosexual prejudice, a relation partially mediated by both authoritarianism and low levels of intergroup contact. All analyses controlled for education and socioeconomic status. Our results suggest that cognitive abilities play a critical, albeit underappreciated, role in prejudice. Consequently, we recommend a heightened focus on cognitive ability in research on prejudice and a better integration of cognitive ability into prejudice models. And here you have recent state comparisons of obesity. As would be expected, the correlation isn't perfect, but it's pretty close. Conservatives (especially those in the staunchly conservative bible-thumpin' south) tends to be fatter. This comes as little surprise, in a sense. Since conservatives can't believe climate scientists who tell them things they don't want to hear, why should they believe the doctor who tells them they need to shed some pounds to stay alive. Below we have high school graduation rates by county. This map seems to line up pretty well with the above maps as well. This helps understand why so much of the conservative rhetoric seems so juvenile. Many of the targeted voters have the education levels of children. This doesn't bode well for conveying complex environmental issues to the public. Since the uneducated have no benchmark to tell if the media is exaggerating any scientific finding, I don't know how to interpret the following chart. But the difference is stark. Uneducated populations are also easily swayed by corporate propaganda demonizing unions, so it comes as little surprise that the red states tend to have less union representation (and hence, tend to have low wages). 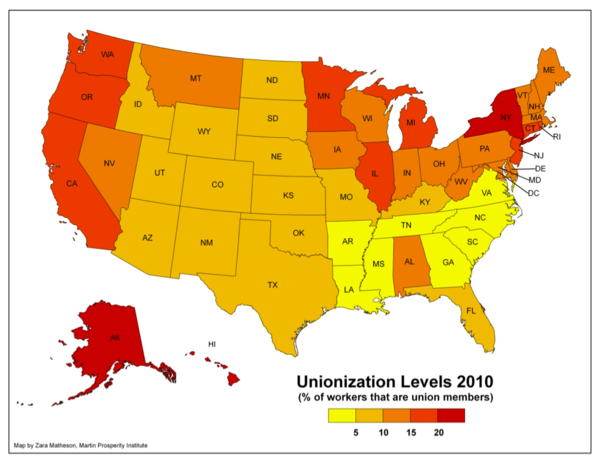 Research has shown that not just individuals but states as well benefit from unionization. We should also mention that it's a bit odd that conservatives want to get rid of the nanny state since conservative states (along with several of the northeastern states) benefit most from federal aid relative to their tax contributions. If the conservative politicians in Congress are really so keen on getting rid of earmarks, they should start at home. Of course, many of these fat, ignorant, anti-environmentalist, violent, science-denying folks tend be "deeply religious." In short, the word "conservative" seems to be an apt label for a syndrome--a long list of psychological and cultural maladies--that wreak havoc on both individuals and communities. The U.S. would be so much better off if we could let the Republican Party die its natural death and allow the Democrats to fill the role of corporate-backed corrupt party of political hacks (we only need one such party after all). We could then work on establishing a truly alternative party far to the left of the Democrats that could address real problems with real solutions.